The only thing more enchanting than twelve-year old Audrey’s precocious artistic talent is moxie so formidable that not even a broken foster care system, ambitious adoptive parents, or terrifying show people can defeat it. Armed with her trusty sketchbook and a magical, fuzzy friend, this plucky heroine sets out on a quest to find all the members of a legendary council devoted to erasing the evil between earth and a mysterious realm. 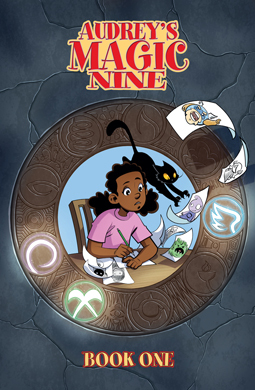 Featuring over 120, full-color pages and bonus short stories, Audrey’s Magic Nine is a fanciful, all-ages treatise on the power of the imagination.